When fishing, many times people are just looking to have a good time and catch what they can catch. But other times there are particular fish you may be looking to catch on your vacation or fishing trip. If it is salmon you are looking for, there are some fly fishing tips you will want to be aware of. Interestingly enough, salmon typically do not feed in a river but are still more than willing to strike. The reason for this is because salmon are aggressive and predatory by nature. Therefore, you should always be on the lookout for salmon if you are fishing in a river. The big thing you must know as a fisherman about salmon is they prefer the cooler temperatures. When it comes to a bright and sunny day, the salmon tend to go deep down and hide in holes. This makes it extremely difficult to catch any because of the crevices they go into. The reason salmon prefer the cooler temperatures is because they need a lot of oxygen, which is more abundant in cooler water. If you can catch them on a cloudy day that is much cooler, it will be far easier to snag some salmon while fishing. If you do decide to fish for salmon on a beautiful sunny afternoon make sure to bring a lot of flies. This is a fly fishing tip that many people forget about or overlook. The reason for this is because you will find yourself fishing into rough areas with rocks, debris and foliage. While it can be a pain to lose a lot of flies due to the debris and rocks, it is well worth it when you bring home that prize fish. As with all fish, it can be difficult to determine where the best spot is to find salmon. Salmon tend to swim up and down the stream following the pattern of the sun and temperature. 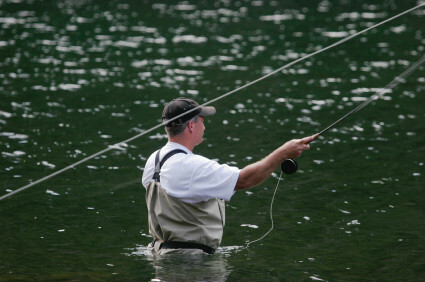 You will typically have a much better chance finding salmon in shaded water and cooler water. Because of this, it is recommended you always bring a thermometer to place in the water. This will allow you to measure the temperature and get a general idea of where the salmon are. While these fish will still be willing to strike in rivers, lakes is where you will find the aggressive salmon looking to jump on for the ride. If you are going to be fishing for salmon, it is recommended that you bring plenty of flies, follow the clouds, and know the water temperature. From there, it is up to you to throw in your line and see how many fish you can catch.